Winter may be the quiet season for gardening jobs but it is the ideal time to plan for next year. With this in mind we have once again put together a small catalogue for you to browse and get some ideas of some unusual houseplants to grow for summer colour. 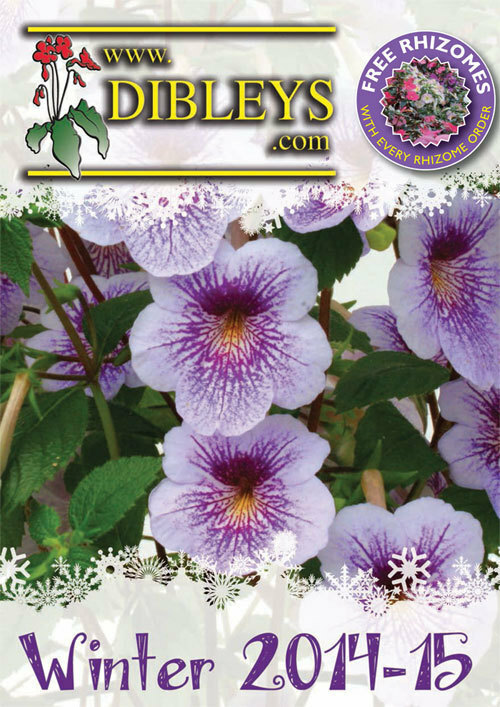 Achimenes are late spring/summer blooming plants, but the rhizomes need to be planted in spring to encourage a long flowering season. Throughout the summer achimenes thrive in the same growing conditions as streptocarpus; keep on the slightly dry side in good light but do not grow them in full summer sunshine. This is also the time of year to search for Christmas gifts; and towards the back of this catalogue we have included some items which we think would make excellent presents for gardening friends and relations. The greenhouse caddy is ideal when space is short to keep small but important gardening bits and bobs together. We are now offering a wider range of our streptocarpus as flowering pot plants with matching coloured ceramic pots; ideal as Christmas gifts for friends and family. Streptocarpus ‘Crystal Ice’ is an excellent long flowering variety producing masses of blue and white flowers, and is now available in two sizes.